Krishna Reddy (1925-2018) was a highly accomplished artist, art educator, and author who made major contributions to revolutionizing the technology and artistic possibilities of intaglio simultaneous color printmaking. Born in India, Reddy first studied sculpture in Santinketan, West Bengal, and traveled to Europe in the 1950s to study under sculptors Henry Moore, Ossip Zadkine, and Mario Marini. His residence and study in Europe also introduced him to master artists like Fernand Leger and Alberto Giacometti. It was during this time period that he first met Stanley William Hayter, founder of the legendary print studio Atelier 17 in Paris. Reddy remained involved with Atelier 17, eventually becoming and working as its Co-Director until 1976. In 1976, he immigrated to New York where he continued both his art and teaching career. He established Color Print Atelier, a special workshop for working artists and teachers, and later established and chaired New York University’s printmaking department. He was designated as Professor Emeritus of Art and Art Education at NYU in 2002. Throughout his career, he continued to give workshops and lectures at universities and art spaces across the US, Europe, and India. 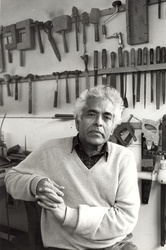 The Krishna Reddy Papers consist of materials that document Reddy’s life and work as an artist, art educator, and author from 1943 to 2011. The bulk of the collection’s papers date from the 1970s through the 1990s and include records of exhibitions, photographs, slides, sketches, video footage, correspondence, press coverage, reviews, original manuscripts, and working files for book publications. To learn more about the contents of the Krishna Reddy Papers, located at New York University Archives, view the collection’s finding aid.